Simple to use, effective heating to hire for your marquee or venue. 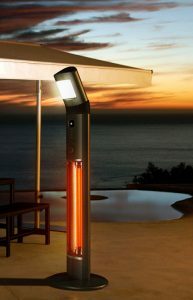 A practical alternative to a patio heater where ceiling clearance may be an issue. Casts an approximate 3 to 5 metre circle of radiant sun-like warmth. Radiated warmth approx. 3.5 metres in diameter. Full 9kg Gas bottle included with hose and POL regulator. 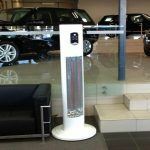 Platinum hire have a range of climate control options for hire. Portable air conditioning has proven itself to be an economical method of providing additional cooling. It works precisely where and when it is needed the most to cool people or equipment. Portable coolers are quick and easy to install, they are simply wheeled in and plugged into a regular power point. They cool only the area that needs attention and not the entire room or plant. Portable air conditioning units use flexible ducting and a temporary customer ceiling time to vent warm air into the ceiling space. Where this is not possible they can be vented out a window or door. Condensed moisture is collected in tanks or piped to a drain.